Stevie Wonder opens Summerfest 2008. I think that this is the sleeper show of the Summerfest lineup. 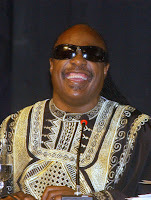 Stevie Wonder has a fan base as broad as Tina Turner, or Elton John. The kicker is that Stevie Wonder hasn't played in Milwaukee for years. The Stevie Wonder appetite has not been satisfied. Other side stage shows have been announced as well. My future posts will comment on those shows. For now we leave you with Mr. Wonder. I remember an old clip I found on Youtube of Stevie Wonder playing the drums. He played a workmanlike job, but I prefer him on the keyboard and vocals.